NB – Before reading any further, please note that ALL of the anaconda-encoiled animal photographs and anaconda-encoiled mechanical device photographs contained in this article are photo-manipulated FAKES (with the sole exception of the anaconda-encoiled white cow photos), so none of the apparent animal 'victims' in these photos were victims (except for the white cow, but it did survive – see later). The internet is increasingly a limitless source not only of fake news but also of fake photographs, with animal subjects being particularly popular. A closer look, however, soon revealed a very different scenario. To begin with, I could readily see from its markings and colouration that the 'python' in question was actually a green anaconda Eunectes murinus, the largest and most familiar of the four anaconda species currently recognised by science. Bearing in mind that lions occur naturally in the wild state only in Africa and limited regions in Asia whereas all anacondas are entirely restricted in the wild state to tropical America, it was obvious, therefore, that if this photo were genuine, the grisly scene that it portrayed could only have occurred somewhere in captivity. 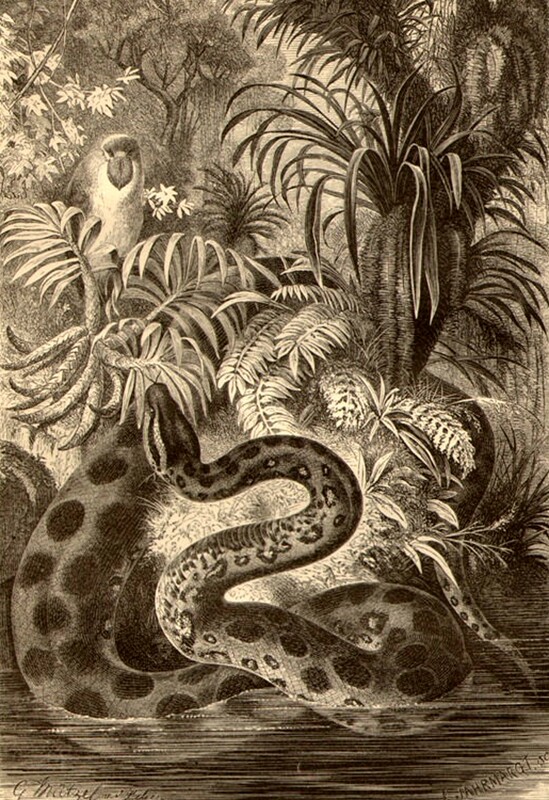 Moreover, examining the image itself in enlarged form soon revealed that it was an inexpertly-produced example of photo-manipulation, with the edges of the anaconda's coils in particular appearing far too sharp and crisp in comparison to the remainder of the image. So in answer to my correspondent who sent me this lion/anaconda photograph for my opinion as to whether or not it was genuine: it's not – the lion was lying, inasmuch as in the original, genuine photo its roars were telling a very different story from the one depicted in this fake version, in which the anaconda was most definitely a con. 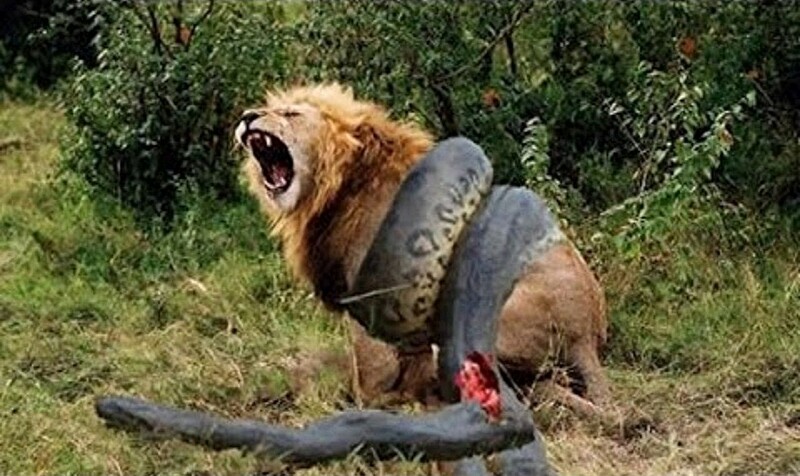 While investigating this fake lion/anaconda photograph, I also encountered a short YouTube mini-investigation video that had been uploaded on 13 November 2015 by Cary Darling with the user name Hoax Factor (click here to view it). 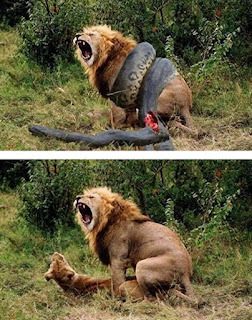 In it, he begins by showing this same fake photo, which had been submitted to his Hoax Factor Facebook page by a reader called Chad, then after a fairly lengthy if light-hearted exposition he concludes his mini-video investigation of that photo by presenting the same original image of mating lions (albeit heavily pixellated) that I had independently discovered. 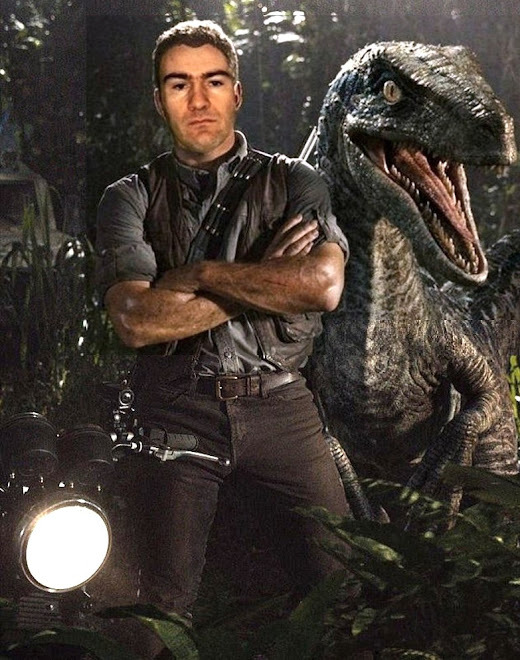 During my own researches, however, I was able to take this case further – much further, in fact – because it soon turned out that this fake lion/anaconda photograph was far from being unique. On the contrary, while pursuing it online in search of the original, genuine lion photo that has been used to create it, I swiftly discovered that a startling number and diversity of other fake anaconda-depicting photographs existed that featured a range of different 'victim' animals. These include two other lion photos, two different tigers, two different jaguars, a black panther, cheetah, Alsatian dog, elephant, black-and-white cow, rabbit, and (inevitably) various versions featuring humans, as well as some mechanical items, such as a tractor and mechanical diggers or excavators, but all of them united by the presence of precisely the same anaconda coils and outstretched body. As the anaconda coils and body were identical in all of the above fake photos, it seemed pointless wasting time seeking out the original, genuine photo for each and every one of them (especially as the more I looked online, the more fakes using this same anaconda image I found), but I did devote a little time to tracing those that had been used to create some of the more dramatic fakes. 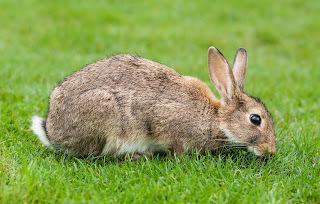 So, for instance, click here to view the original, genuine cheetah photo, here to view the original, genuine (flipped) black panther photo, and here for the original, genuine rabbit photo. But that was not all. A second uniting factor was that all of these fake photographs were not only appearing in numerous websites but also turning up as introductory thumbnail pictures to videos that had been uploaded onto YouTube during the past couple of years or so, and by what appear to be a very sizeable number of users, judging from the number of different user names involved (but which, for all I know, may in reality all be one and the same person, or may at least be only a small number of persons but using a plethora of different user names). And the third, key uniting factor was that not one of these fake thumbnail pictures actually appeared in the video that it was being used to introduce. In other words, based upon their graphic, sensationalised appearance, they were being used deliberately but dishonestly as click-bait, luring video viewers to watch the videos in order to see the action depicted in the photos, only to discover that no such action was contained in the videos. All that remained for me to do now in order to bring this photo-detective investigation of mine to a successful close was to uncover the original, source photograph containing the anaconda and its coils that had been used to create all of the subsequent fake ones. So I conducted yet another, much lengthier Google search, but this time focusing upon the anaconda itself rather than upon the varied array of creatures or machinery that it was wrapped around in the series of fake photos that I had uncovered so far. To my great delight, I finally found it – and this is how. First of all, I discovered a video that had been uploaded onto YouTube by someone with the user name GuruQA on 28 August 2015 (click here to view it). This video provided what turned out to be a major clue in relation to tracing the elusive original anaconda photograph. Filmed in the wild in the anaconda's native homeland, Brazil, it consists of a segment of amateur video footage (which I'll refer to hereafter as AVS1) that begins with a split-second shot showing a woman with her back to the camera appearing at the right-hand edge of the screen. The camera then pans to a live white cow on the left-hand side of the woman, which is shown in its entirety, but once again only for just a split-second, lying down on all fours on some muddy grass, with a large anaconda coiled around its mid-body region. The camera then pans to the rear end of the cow's body but still showing the anaconda's coils, which can now be seen to be moving slightly. The anaconda then comes off the cow completely, followed immediately by the cow's tail and hind feet kicking up dust at the extreme left-hand edge of the screen as the cow evidently makes a very swift exit; it does not appear anywhere in AVS1 again. Meanwhile, AVS1 now reveals the presence of several people (their excited voices, speaking and shouting in Portuguese, could be heard from the very beginning of AVS1 but the people themselves had not been seen until now, with the sole exception of the one afore-mentioned woman), who vainly attempt to move this very big snake by hauling upon its tail for a time before making a cautious but ultimately successful attempt to pick it up (the actual picking-up procedure is not shown, presumably because it took a fair length of time to accomplish), after which they all walk away, carrying the anaconda aloft with them, and are shown taking it to a stretch of water into which they then release it and watch it swim away. 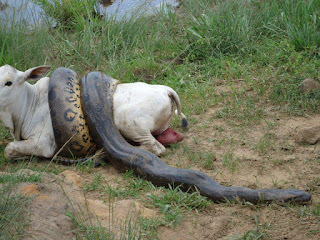 So we know that both the white cow and the anaconda ultimately survived. Of especial note is that AVS1 includes a panning shot that directly links the anaconda moving off the cow (and the cow promptly fleeing) to the people beginning their attempt to pick it up, thereby establishing that these two activities are indeed part of a single continuous piece of footage, and not two separately-filmed pieces spliced together. Using TinEye's Reverse Image Search, I was able to trace examples of the OWCA photo online dating back as far as 17 November 2013 (this latter, earliest online example of it can still be viewed, as the tenth of ten photos, here). I then produced a screenshot of the brief footage in AVS1 showing the rear end of the cow lying down on all fours on grass with the anaconda's slightly-moving coils still wrapped around its centre – and if you compare the cow's rear end, the orientation of its visible hind leg, and the anaconda's coils as seen in this video screenshot with those equivalent anatomical structures in the OWCA photograph found earlier by me online and also present at the beginning of AVS1, you will see that they unquestionably depict the same animals. And now that this significant fact has been fully established, if you then view a second screenshot taken by me, capturing the split-second AVS1 footage of the encoiled cow as seen in its entirety this time (and occurring immediately before the footage of the cow's rear end and the anaconda's moving coils as captured in my first screenshot), even though the anaconda's coils don't move in this split-second earlier footage its screenshot provides further corroboration that the encoiled cow seen in AVS1 corresponds precisely with the encoiled cow seen in the OWCA photograph. Clearly, therefore, alongside whoever filmed AVS1 was someone else who snapped some still photographs of the anaconda and its encoiled bovine victim – indeed, AVS1 actually shows a woman with a camera snapping photos of the anaconda – and it is one of these genuine photos, specifically the OWCA one reproduced by me above, that has subsequently been used by person(s) unknown to manufacture the startling array and diversity of fake photos revealed and exposed by me here in this ShukerNature blog article. Summarising all of this: the above three images collectively confirm that the OWCA still photograph whose anaconda coils and body are identical to those in all of the fake photos presented here is itself genuine, not fake, because the animals in it correspond precisely in form and pose with those actually seen moving in video footage contained within AVS1. Since discovering AVS1 as posted on YouTube by GuruQA in August 2015, plus the OWCA photo and others in that same online series, my path has once again crossed with that of Cary Darling, because I subsequently found out that another short Hoax Factor mini-investigation video uploaded by him on YouTube, this time on 15 December 2015 (click here to view it), has also focused upon this same subject, and has actually included a clip from AVS1 (but he did not cite GuruQA or anyone else as his source for it) as well as the key OWCA photograph. 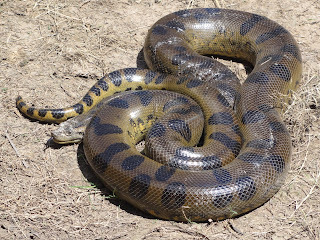 Crucially, however, although it has provided a most welcome service in drawing attention to the whole fake anaconda photos situation (and continues to do so), in my opinion the Hoax Factor mini-video does not provide an absolute guarantee from its clips alone that the specific cow/anaconda footage is a video, rather than merely a photograph. This is because AVS1's brief but key footage showing the anaconda's coils actually moving while wrapped around the cow is not included in the Hoax Factor mini-video. Equally, I personally feel that the latter mini-video does not provide unequivocal verification that the cow/anaconda footage and the anaconda/people footage are from the same video segment, because it does not include the specific footage from AVS1 that contains the all-important panning shot directly linking the cow/anaconda footage to the anaconda/people footage. (f) it is indeed, therefore, both genuine and the source of the anaconda image that appears in all of the fake photos. And so: although the perpetrator(s) of the fake photographs investigated by me exclusively in this ShukerNature blog article presently remain(s) unidentified, it is definitely safe to say that no lions, tigers, panthers, elephants, cows. rabbits, etc etc were harmed in the making of any of these images. Thanks to some laborious but ultimately worthwhile and successful photo-detective work, another ostensibly complicated case, initially seemingly to be as encoiled as the anaconda featured within it, is duly unravelled and closed. NB – Despite appreciable efforts made by me, so far I have been unable to identify the © owner/source of any of the photos included above, but all of them are reproduced here on a strictly educational, non-commercial Fair Use basis for reference purposes only. While conducting my researches relating to AVS1 as uploaded onto YouTube by GuruQA in August 2015 and showing the white cow/anaconda incident, I also discovered a second version of this segment (referred to hereafter by me as AVS2), which offered what may – or may not – be a very interesting additional insight into the videoed white cow/anaconda incident. 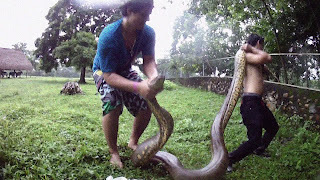 Uploaded onto YouTube by a user named Snake Channel on 9 January 2017 (viewable here), AVS2 cuts off abruptly at the end without showing the people actually releasing the anaconda into the stretch of water to which they had carried it after picking it up (as seen in AVS1). However, it includes some extra, earlier footage not seen in AVS1 and which is most intriguing. AVS2 begins by showing some of the same photographs (including the OWCA photo) of the anaconda-encoiled white cow seen its entirety down on all fours on grass that were also shown at the very beginning of AVS1, after which it presents a short, narrated, professionally-made video section concerning anacondas in general that had seemingly been excerpted from a National Geographic documentary regarding this snake species (because the Nat. Geog's famous yellow rectangle logo is superimposed upon the opening footage of this section). This opening section then morphs into the first of two amateur video sections (referred to by me hereafter as S1 and S2 respectively). S1 shows an anaconda emerging from some reeds at the edge of an expanse of freshwater (river or lake) and coiling swiftly around an unsuspecting white cow standing in the water nearby. In just a very short time, the anaconda's constricting actions appear to have rendered the cow at least unconscious, if not dead, because it soon lies motionless in the water. 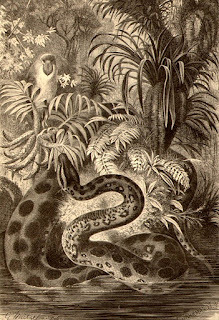 While this tragic scene plays out, the voices of S1's film-maker and some other people present in this scene and speaking Portuguese (but not actually seen in it) call out loudly, seemingly attempting to frighten off the anaconda (but apparently forgetting or not realising that snakes are deaf to most airborne sounds). S1's footage then stops but new footage begins immediately, constituting S2, with the overlying title 'An Hour Later' appearing for a few moments. S2 turns out to be one and the same as AVS1, as uploaded by GuruQA, except that AVS1's split-second clip panning from the woman on the right-hand-side of the screen to the anaconda-encoiled white cow seen in its entirety down on all fours on grass is not included in S2. Instead, S2 begins with the shot of the rear end of the anaconda-encoiled white cow, after which its footage is identical to that in AVS1 (except that, as noted earlier, it cuts off before the anaconda is released by the people into the stretch of water). The overlying title 'An Hour Later' appearing for a few moments at the beginning of S2 is clearly meant to demonstrate that S1 and S2 are merely two scenes from the same incident, shot an hour apart but featuring the same white cow and anaconda. If this is correct, it also means, therefore, that the cow was indeed merely unconscious, not dead, in the water during S1, and that during the intervening hour between the end of the events seen in S1 and those beginning in S2, the cow had been rescued and hauled out of the water onto the grass by the people heard in S1 and both heard and seen in S2. However, I must confess that I am by no means convinced that S1 and S2 do indeed depict two different scenes from the same incident, wondering instead whether they actually depict two entirely unrelated incidents, featuring two different cows and two different anacondas. The reason for my personal misgivings is that in S1, within moments of being captured and encoiled by the anaconda the cow is lying face down, partly submerged, and entirely motionless in the water, looking very much as if it has drowned. 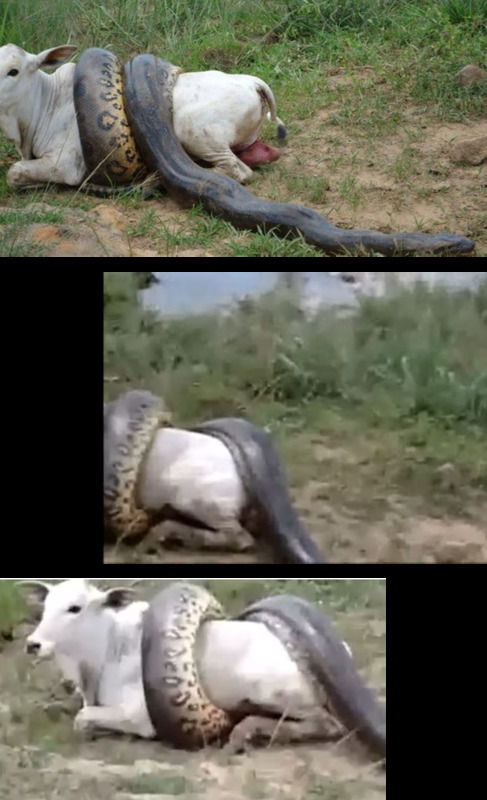 Yet in S2 (uploaded in slightly longer form as AVS1 by GuruQA), the cow looks very much alive, and indeed, beats a hasty retreat as soon as the anaconda comes off it. Fortunately, the question of whether or not S1 in AVS2 does indeed depict an earlier part of the incident depicted in S2 has no bearing upon my findings concerning the direct relevance of S2 (in its longer form as AVS1) to the subsequent creation by person(s) unknown of the various fake photographs exposed by me in this present ShukerNature article. Thanks Karl, you continue to earn my respect and admiration. As a researcher/blogger/administrator for two Alternative News sites, I find myself continually tracking down the origins of images and stories which hint at fakery (as they sadly often turn out to be). While the internet has opened new horizons in research and communication, it has also brought disinformation and hoaxes which muddy the waters woefully, and Cryptozoology, Ufology and paranormal research are prime targets for the con artists. Keep up the common sense approach and sleuthing mate!